In 2014, I was flattered to have been approached by the American Civil Liberties Union (ACLU) Shasta Chapter to be their keynote speaker to address Government Secrecy, Drones, and Militarization. After each police involved death, I would revisit my notes and wonder why I never published them. After watching this video clip on my FB page on July 10, 2016, I decided to share an excerpt from the ACLU address of April 13, 2014. Historians and political scientists have warned us about dangerous war fever sweeping the United States. Today we have gone beyond that. The “Global War on Terror”, a war indefinite in duration, against an ill-defined and shifting enemy, al-Qaeda, [ISIS did not exist in the official narrative at the time] is now being armed in Syria [“moderates”] without a clear explanation of American strategy or a specific definition of victory, or even a way to measure progress in the struggle has taken its toll on civil liberty. 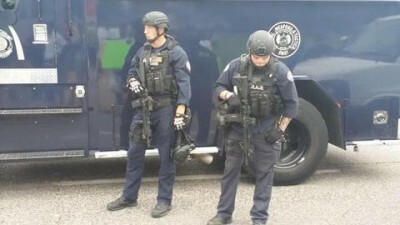 The problem of militarization poses a danger to the very character of American government and society. Over half a century ago, Supreme Court Justice Robert Jackson concluded that “by giving way to the passion, intolerance and suspicions of wartime, it is easy to reduce our liberties to a shadow, often in answer to exaggerated claims of security.”. That day is here. Not only are we under constant surveillance, but take for example the kill list. A list which began under the Bush administration as a rationale for murdering suspect citizens of countries with which the United States was not at war has become Obama’s kill list and the scope of the list has been expanded to include the execution, without due process of law, of U.S. citizens accused, without evidence presented in court, of association with terrorism. And this is accepted by the people. No protests. The Framers of the Constitution recognized such dangers when they carefully subordinated the military to civilian authority and attempted to limit the power of the President to initiate war. Gregory Foster, a former Army officer and West Point graduate who now teaches national security studies at the National Defense University in Washington said that principle of civilian control of the military—an early building block of American democracy- has become the civilian subjugation to the military. Today, the degree to which society’s institutions, policies, behavior, thought, and values are devoted to military power and shaped by war are alarming. But now, we see that this war has been internalized, whether you look at drones, kill list, or militarization of the police force. During the Clinton administration, Congress passed what’s now known as the “1033 Program,” which formalized Reagan administration’s directive to the Pentagon to share surplus military gear with domestic police agencies. Since then, millions of pieces of military equipment designed for use on a battlefield have been transferred to local cops—SWAT teams and others—including machine guns, tanks, armored personnel carriers, etc. The Pentagon’s 1033 program has exploded under Obama. Bill Clinton also created the “Troops to Cops” program which offered grants to police departments who hired soldiers returning from battle, contributing even further to the militarization of the police force. Is it any wonder that [Mayor] Bloomberg proudly bragged of “hav(ing) my own army in the NYPD” and who used that army to spy on peaceful Occupy Wall Street protestors? And what of “to protect and to serve”?